If done correctly anchor text and reciprocal links can have a tremendous positive impact on SEO. These two concepts work together to provide valuable link value to your website and have the potential to increase your website ranking. In our last blog entry “Creating Infographics to Build Links and Increase SEO” we briefly touched on the topic of Anchor text. The anchor text is the hyperlink or clickable text that is found on a web page. Using accurate anchor text is essential for good Search Engine Optimization and when used appropriately it can drastically boost your rankings in the search engines. The anchor text provides descriptive and useful information for the page that it links with. The anchor text enables websites to use cleaner looking text rather than displaying an unpleasant and distracting hyperlink. For example a hyperlink for Internet Beacon.com would look like <a href=”http://www.internetbeacon.com”> Internet Beacon</a> however by using anchor text it would present as Internet Beacon on the page. The most common mistake when dealing with anchor text is using the dreaded “Click Here” anchor text. Click here not only causes you to miss out on the possible SEO benefits it also neglects to describe the content to the page visitors and the search engine crawl bots. At one time Anchor text was heavily manipulated and was referred to as Google Bombing. Google Bombing used large amounts of anchor text to influence the rank of a link that directed visitors to unrelated content. For example during the 2004 United States presidential election the anchor text of “miserable failure” was linked to the George W. Bush‘s White House biography so many times that when users searched for the terms miserable failure the link to the biography appeared in Google’s search results. However in January, 2007, Google created a new algorithm which reduced the impact of Google bombs but none the less anchor text still remains important in SEO. Keep it short – Try to keep your anchor text under 60 characters. Use Keywords – Include your targeted keywords to increase SEO benefits. Make it unique – Each web page should have a unique anchor text to describe it, try using variations and adding secondary keywords to mix it up. Make it readable – Optimizing anchor text for the search engines is very important but it is also equally important to make sure that it makes sense to your human page visitors as well. 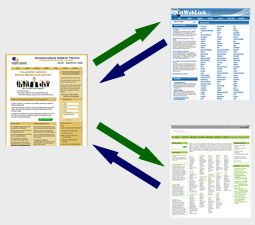 Reciprocal links are when two websites agree to exchange links with each other. Anchor text is crucial when dealing with reciprocal links because you want your link partner to accurately describe your site and your site to rank for the keywords that you are targeting. Reciprocal linking works both ways, when you place another website’s link on your page it is always good practice to use anchor text that is going to influence their SEO goals and positively portray their website. Search engines look at both the quantity and quality of sites that link to your site. A Reciprocal link can bring more traffic and can boost your web rank. Finding and convincing a good quality site to link with you takes time, effort, and some luck. The following are some tips on how to obtain a reciprocal link and begin building your backlink portfolio. Initiate the link exchange by first placing a link to them on a relevant page from your site. Once you have placed a link to their website, contact the owner of the website via email. Gather information from the website about the owner so you can address them by their name and make friendly small talk before presenting your proposal. Inform the website owner of who you are, what your website is, why you’re interested in linking to their website, and how you both can benefit from the exchange. Let the website owner know that you have already taken it upon yourself to link to their website and let them know that if they agree to exchange links than you are happy to modify the anchor text to something of their choosing. In the email provide them with the URL of the page where you’ve placed their link. Request that they link back your site and suggest a page where the link may be appropriate. Provide the HTML code that includes the hyperlink and the keyword Anchor text so they use the correct anchor text for your link. Give the offer a couple weeks, if there is still no reply then send a brief, polite reminder. Don’t give up, try contacting using another method. If the number is listed on their website call and present your offer to them, however don’t push it on them, if they say no leave them with your information and maybe they will reconsider in the future. Keep a detailed and organized list of sites that you have propositioned a link exchange with so you know who has provided you with a link and who you still need to contact. Finding high quality link partners can be a difficult and time consuming task but the eventual payoff can be tremendous. Search engines like Google assign more value to websites with the most relevant and superior links however it is equally important that you have the proper anchor text in order to rank for your keywords and target your traffic. Although higher quality links provide more link value, try to diversify your link exchanges by not focusing on only high value sites. If websites only exchanged with other higher valued websites then barley any pages would ever gain a solid rank or foundation. I hope that you will find these tips helpful in obtaining reciprocal links and determining the appropriate anchor texts for your links. This entry was posted on Friday, September 9th, 2011 at 9:12 am	and is filed under Internet Marketing, Search Engine Optimization SEO. You can follow any responses to this entry through the RSS 2.0 feed. You can leave a response, or trackback from your own site.